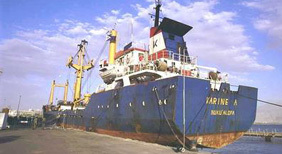 The Karine A Affair, was a military action in January 2002 in which Israeli forces seized the MV Karine A, a Palestinian freighter found to be carrying 50 tons of weapons, including short-range Katyusha rockets, antitank missiles, and high explosives. Omer Mahmad Hasa Ahawi, who directed the weapon-smuggling industry for the Palestinian Authority, had failed in two prior attempts to ship weapons from the Hezbollah in Lebanon. Already under the watchful eye of Israel´s Intelligence, his purchase of a large ship in Lebanon in the summer of 2000, for his next attempt, led to the surveillance and other Intelligence work that ultimately doomed his delivery. At the end of 2001, Israeli Intelligence monitored as the ship was loaded with weapons from Iran and the Hezbollah and concealed with a layer of civilian goods, such as clothes, rice and toys destined for Gaza via Yemen. During the night between January 2-3, 2002, Israeli naval commandos, along with Intelligence personnel, boarded and captured the Karin A and its lethal cargo. The State of Israel confiscated the weapons and distributed the civilian goods to the Palestinians via UNWRA.